Sailing is a passion shared by Ann and myself, in fact Ann introduced this pastime to me. Being involved in sailing, especially keel boats has brought us into contact with a number of organisations. Looking after G-whizz has increased that organisational contact. Ann and I are members of these Clubs. For anybody that is thinking, …..yes we believe that it is important to be a member of a yacht club located some 2000km to the north. Shops: On-line and/or bricks and mortar. I have heard GFS described as a boat shed that becomes a yacht club on Summer Wednesday evenings, and long may it be so. GFS has an active Keel Boat schedule, Enthusiastic Laser contingent and very importantly a strong following of juniors in Sabots. The above picture shows the position of the GFS Clubhouse (Picture right) on the Lane Cove River. The yachts are jockeying for the start of Black Division in a Twilight event, with some blue division waiting for their turn to start mooching along the Northwood shore. In front of the GFS club house is a large dinghy rigging deck, to which a small floating pontoon is attached. The deck not only serves its primary function as a rigging deck for the dinghies and Lasers, but also becomes an outdoor eating area after the Wednesday twilights. At other times, after racing or maybe just a convivial get-together of like souls, the deck plays host to discussions that variously solve the problems of the World, the rules of racing, the Club’s committee performance, boat set up/trimming or just a critique of an individual’s sailing performance. Hence it being known widely as the Deck of Knowledge (I first saw this description in an article written for the Club Magazine “Humbug” by Michael Coleman, Etchells “Eggshells” so, on this site at least I give naming credit to Michael). events can be seen http://gfs.org.au/yachts/results. Inhabited by some of the nice people in the Whitsundays. 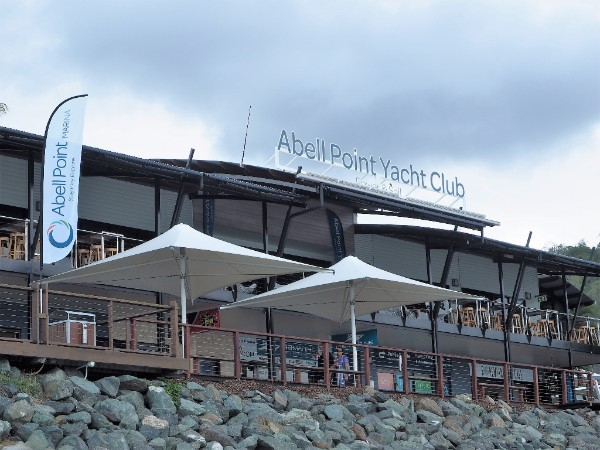 While APYC may not have the profile or membership of the Whitsunday Sailing Club, they have found a niche in the Whitsunday sailing community, now complimenting the larger WSC in sailing/boating organisation in the area. APYC are the organisers of the most enjoyable Coral Coast Rally. Since new G-whizz has had a sail wardrobe exclusively of Doyle sails. Shane Guanaria the current Doyle franchisee in Sydney has continued to provide an excellent level of service and advice. Shane’s attitude to customer service along with Doyle quality, will ensure that G-whizz will continue to remain Doyle powered. Michael is located at Woolwich Marina (The link above). Michael does not have a web page, nor does he need one. It would appear that most of Michael’s work is generated from repeat business and word of mouth recommendations. We are not too sure that we would entrust G-whizz’s annual bottom maintenance, or general maintenance, with any one else. While Michaels work in wood is legendary it is his ability in gel coat repairs that has us spending a bit too much time at his slip. Is a smallish ship’s chandlery and rigging service located in the North Village of Abell Point Marina, Airlie beach. If owners Colin and/or Kerrie are in the shop it is almost worth an entry fee just to listen to the good hearted banter between them and their customers. Quadrant Marine is extremely well stocked and very competitively priced. They will quite often have in stock items that are very hard to find in larger capital city chandlers. Colin tells me that this is probably due to him servicing a very large charter fleet. Colin, Kerrie and their staff do know their “stuff”. Yacht Spot is the Australian and New Zealand agency for J-Boats. Owned by Sandra and Ray Entwistle, located in Newport on the Northern Beaches of Sydney a few doors away from Royal Prince Alfred Yacht Club. Ray and Sandra run their business at the personal level and as far as I can determine they remain strong friends with the majority of their customers, they provide a great coaching service and have competed in a number of races on customers’ boats, including a number of World Championships. Ray has been described as somewhat a enigmatic character (Which sort of makes Sandra a saint), and while he does has an opinion on most things, when that opinion is about sailing it is well worthwhile taking heed of what he says. The pedigree of J-Boats is world renown and Ray and Sandra’s attitude to selling and servicing these boats fits perfectly with that renown. Yacht Spot also are agents for another famous American brand – Catalina Yachts, great comfortable family cruising yachts.